Panel Discussion: What is our Urban Imaginary? 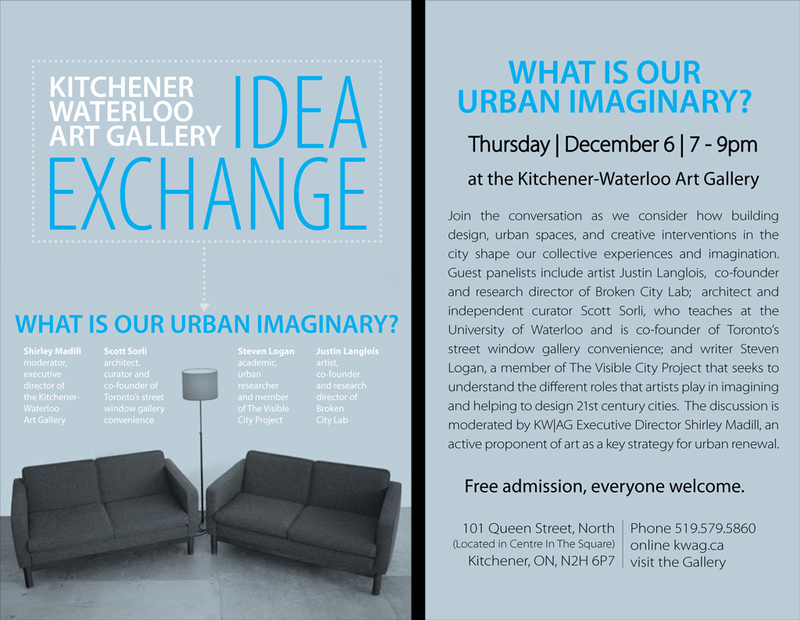 On Thursday, Justin heads up the 401 for WHAT IS OUR URBAN IMAGINARY? Join the conversation as we consider how building design, urban spaces, and creative interventions in the city shape our collective experiences and imagination. Guest panelists include artist Justin Langlois, co-founder and research director of Broken City Lab; architect and independent curator Scott Sorli, who teaches at the University of Waterloo and is co-founder of Toronto’s street window gallery convenience; and writer Steven Logan, a member of The Visible City Project that seeks to understand the different roles that artists play in imagining and helping to design 21st century cities. The discussion is moderated by KW|AG Executive Director Shirley Madill, an active proponent of art as a key strategy for urban renewal. Previous PostPrevious Zine Night End-Of-The-Year Party with RIOT GRRRL Tuesdays!